Based on the Academy Award-winning animated feature film, Beauty and the Beast has won the hearts of over 35 million people worldwide. This classic musical love story is filled with unforgettable characters, lavish sets and costumes, and dazzling production numbers including “Be Our Guest” and the beloved title song. Crystal Heckert, the head of wardrobe takes us behind the scenes to talk about the costumes, production, and adapting the animated film for the stage. Be Our Guest – Jillian Butterfield and the cast of Disney’s Beauty and the Beast. Tell me about the challenge of bringing an animated fantasy to the stage. How did you manage it? Crystal Heckert: Ann Hould Ward, the costume designer, did a great job of bringing the animated fantasy to Broadway. With a clear vision and a well thought out design, she was able to create a show that was able to transition to travel on the road. My challenge, on the road, is to maintain the artistic integrity of the show, and ensuring that everyone who comes to see the show is seeing the same show every time. Do you find that the original animated movie is very Broadway-esque? I imagine that would be easier to envision it on stage compared to other film-to-Broadway adaptations. 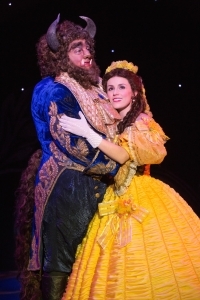 CH: Personally, I do find that the original animated movie lends itself well to a stage show. There are all of the elements that an audience wants: it has a great story, a moving orchestration, loveable characters, sparkle, and magic! I know that the design team worked hard to bring a well-loved story to life, and I think that they did a wonderful job. in Disney’s Beauty and the Beast. The film has bits of magic at its core. Can audiences expect to experience that magic at the live show? CH: Yes! 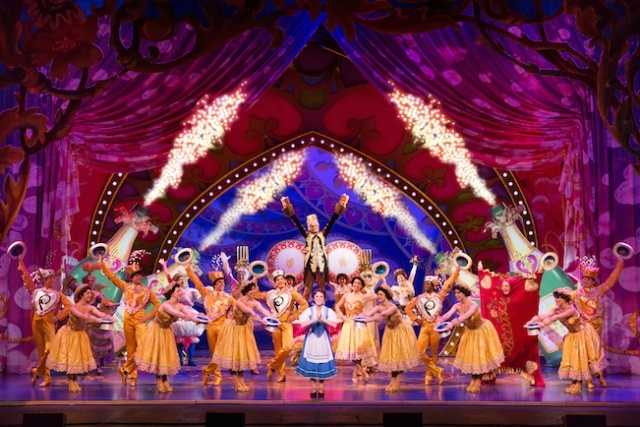 There are lots of magical moments in this show, and the audience is sure to enjoy all of them! A lot of the costumes are handmade. What does that add to the show? What do you love about working on a show with such fantasy, magic, and animation? CH: I love that the show is always interesting. With all of the different elements, it’s a continual challenge to keep up with it all and make sure that everything looks the best that it can. I’ve been able to learn a lot about how these costumes need to function, and what it takes to keep them going. When we move from city to city, sometimes three times a week, the goal is to make sure that every audience is seeing the same show as the cities before and after them, and I enjoy that challenge. Disney’s Beauty and the Beast Pippin runs at the Orpheum Theatre through March 15. For more information and to purchase tickets, head to www.hennepintheatretrust.org.